Technology is swiftly moving into the world of “wearables”—pieces of technology that users can wear on their body for easy access, rather than being contained in a phone or computer. Smartwatches like the Apple Watch and fitness trackers like FitBit are some examples of wearables that have become incredibly popular over the last few years. Wearable technology like virtual-reality goggles and glasses, like Google Glass, are also rapidly gaining a place in our daily lives. But what about technology that you can wear in your ears? Many innovators believe that “hearables” are a nearly-untapped goldmind of wearable technology. In 2015, Microsoft CEO Satya Nadella commented that “things you wear on your wrists, in your ear, and on your eyes” are the next big things in technology. His comments may have jump-started a wave of new hearable technology. According to Techcrunch, hearable companies have gained nearly $52 million in venture capital and crowdfunding. One might consider hearing aids the original hearables. But what other new and innovative technologies can we look forward to? 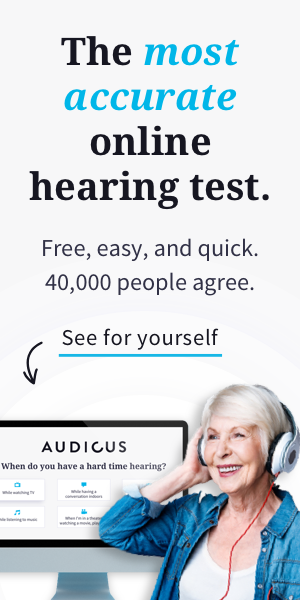 Audicus itself is changing the way hearing aids are designed and worn—we have created the Uno hearing aid, which is the only CIC hearing aid to have a built in ventilation system to produce a more natural sound for the user. Hearable tech goes beyond just hearing aids, however. Doppler Labs are one of the leading companies for hearables, and they’ve created several fascinating products. The Here earbuds are pint-size, individual speakers for your everyday life. These are more than just headphones—you can use them to adjust the volume in any situation you’re in! If you’re at a concert and the music is too loud, you can turn it down. Or, if you’re out with friends and have trouble hearing what they’re saying, just turn up the volume. The Here system even has a setting that silences the annoying sound of crying babies around you. These earbuds are mainly for music lovers, as they allow you not only to control the volume of your environment but also to mix sound levels to your liking. Doppler has also recently come out with a new set of earbuds, called the Here One. In addition to adjust volume and mixing sound, these earbuds also can pair up with your smartphone and play music, take phone calls, and interact with Siri. The Here One model is more advanced than the original, and allows you to mold and layer different types of sound. For instance, you can adjust the sound settings to allow you to listen to music while you’re talking to someone and hear both sounds easily. A truly revolutionary type of hearable that is making a lot of waves in the tech world is the Pilot—a smart earpiece from Waverly Labs that can translate different languages in real time, directly into the wearer’s ear. Two people can have a conversation in different languages without the cumbersome nature of using a translation app or constantly looking up words in a dictionary. The Pilot uses a custom smartphone app but can also be used offline, making it easily accessible when traveling overseas. It’s clear that hearables are an exciting new sector of technology that is growing incredibly fast. Many hearables are crowdfunding on sites like Indiegogo or Kickstarter, so it might be worth your time to do some research and invest in technology of the future! Hearables are making communication easier and more efficient, and can improve the lives of those who suffer from hearing loss. We can’t wait to see what else these hearing innovators come up with! My Right Ear is Totaly gone and also Left Ear is very hard of hearing, problems in communication.